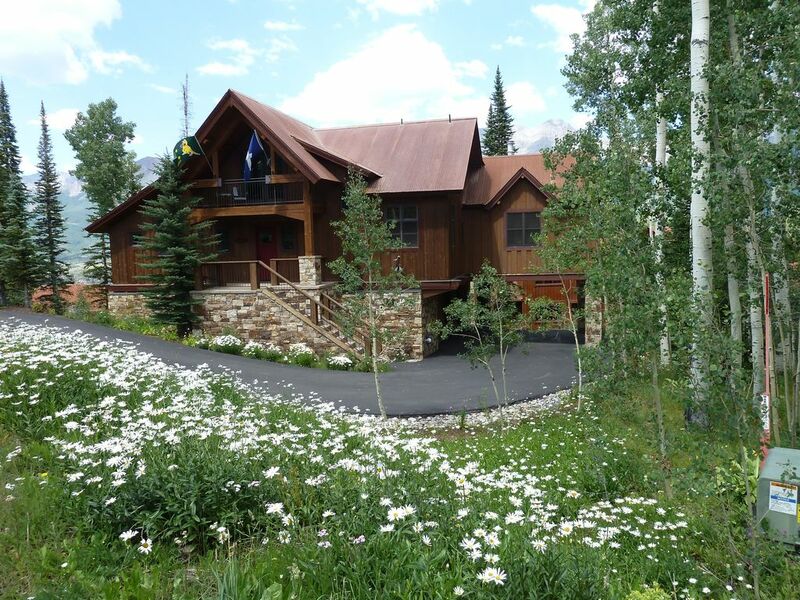 Your perfect mountain retreat in Telluride,ideal for your ski vacation or to enjoy the multitude of outdoor,musical and cultural activities over summer. Located among the ski slopes of Telluride's Mountain Village amidst aspens and fir trees and handcrafted in timber with 4 bedrooms, a large loft, games room and 4 and a half bathrooms, this fantastic family home combines comfort with luxury in a very convenient location.In winter you can ski out to the Double Cabin ski trail which is also just an easy 120 yard walk away. When the famous Colorado snow melts away the supermarket, liquor store and gondola are a very short walk away. Owned by well travelled Australians who think Telluride provides the best overall skiing experience in the world providing runs for all standards from beginner to extreme skier or boarder, every effort has been made to ensure that 'EUREKA' will be your home away from home. All bedrooms have ensuite bathrooms and flatscreen tv. The home has 2 master suites.one has a steam shower and jacuzzi tub. the other master suite has a shower,soaker tub and its own gas fireplace.The 2 guest rooms can be set up as kings or twins depending on your needs. The flexible bedding configuration makes the home ideal for 4 couples or 2 families with children. A bedroom with its own attached bathroom means no lines to get into the bathroom. Upstairs the very private and large loft has a very comfortable double sleeper lounge when you are not watching cable tv on the big screen .It is also an ideal area for the kids. Children and adults alike can enjoy the 7 foot pool table in the loft games room and the large hot tub on the back deck. The home has spectacular views of the San Sophia Mountains that can be enjoyed from many rooms in the home or while you relax in the hot tub. No need to bring your car as Mountain Village provides a free door to door Dial a Ride which can take you to shops ,restaurants,the supermarket and liquor store and the gondola. The Mountain Village and the town of Telluride are connected by a free gondola, public transport at its best! In summer, enjoy all Telluride has to offer in scenery, outdoor activities,hiking,4x4 trails to old mining ruins, fantastic mountain biking options and Telluride's large number of festivals. The word "Eureka"became an indelible part of the history of Australian democracy when gold miners revolted against petty officialdom at the Eureka Stockade in the Victorian goldfields in 1854. "Eureka "'has long been associated with gold.Derived from a Greek word meaning "I have found it" it was made famous when uttered by Archimedes at the time he discovered a means of measuring the density and thus the purity of gold.In more recent times it has become the exclamation of prospectors lucky enough to strike it rich. In our "Eureka"we have found the perfect mountain home away from home.We hope you find our home that way as well. The owners of Eureka are John and Catherine Mcintyre. We are Australians who live in Thredbo ,a small ski village in the Snowy Mountains.Yes it does snow in Australia! We owned a boutique property management company that looked after 5 star ski chalets for 12 years so we are well aware of what makes a great holiday. we had been visiting Telluride for more than 15 years before we found the perfect second home. Telluride is truly one of the most beautiful places on earth.It is also a fabulous place to ski and to vacation.We have travelled extensively both summer and winter to many destinations around the world and Telluride was the only place outside Australia that really feels like home to us. Eureka is not a vacation rental property ,it is a home. Our aim is to let our guests experience the same level of relaxation and enjoyment that we experience every time we visit. 2 x 3 seat leather sofas, a fabric covered lounge chair and an upholstered window box that seats 4. We could tell the owners actually use and take pride in this house. From the linens to the kitchen utensils, everything is top notch! The layout was perfect for our 2 families with 4 girls and one boy. We will try to book again. Love this house! We had a fantastic stay at Eureka. The home is large & beautiful. Incredible views from main living room. This is a very well presented home & it's obvious the owners take great pride in their home. 4 lovely bedrooms & a loft area. Plenty of space for everyone. We loved sitting in the hot tub on the deck after a days skiing. The home is well stocked with pantry items which was a great bonus. Kitchen well supplied with everything you could need. We had an amazing time, and can not wait to return. Thank you to John & Catherine for having us. Clean, well stocked house with a good location. We loved that for the little things, such as spices, oil and such, we didn’t have to worry about buying it at the store. That was great because we cooked in every night. Overall, house worked out well for use. We were two families with 6 kids and everyone had a bed and couples had their own master bedrooms, which was a huge plus! We had good snow during our trip so ski out was easy, ski in required some walking, which wasn’t a huge deal. Coming in required about 100 yard walk modestly uphill and 100 yard easy uphill. It also would have been helpful to have boot dryers- because we had good snow, our boots stayed a little wet. And lastly, we tried to utilize the mountain shuttle offsite to return home and when we called, they told us to call back because they were too busy. We never tried after that because we were frustrated and reluctant to rely on it. Maybe it was because we were there at Christmas time, but felt that to be unacceptable. Overall, I would recommend this house. Worked out very well for us. The owner was super helpful and responsive. Thank you! We thought we had drying boots all sorted because this is what is in the information we send to guests before arrival. There are ski racks in the garage.The room next to the laundry downstairs is the ideal place for ski clothing and outside shoes.To dry and warm your ski and snowboard boots,we suggest that you leave them overnight in the coat closet next to the powder room in the entry foyer as the floor heating makes it a very good drying room. Dial a Ride,the town's free shuttle, can get busy at peak times but the wait is usually quite short and we encourage guests to use it whenever needed. The home was absolutely awesome. Everything we could ask for a family vacation place. Close to the gondola. Peaceful wonderful setting. Extremely clean. Our family can't wait to come back to Eureka! Thanks again for sharing your awesome home. This is such a fabulous find!! The house is fully stocked, great linens, awesome hot tub, amazing views and the coolest window seat overlooking the San Sophia mountains. It was super easy to walk to the Gondola to head to Telluride no matter what time of the day or night! John was wonderful to work with and there wasn't one thing we would have changed about our rental experience. Thank you John and Catherine for providing a lovely home for our family to gather. It is very gratifying to us when our very welcome guests get a great experience staying in our home.We try and make the atmosphere welcoming and the home well set up for guests to enjoy their stay.John and Catherine. Mountain Luxury at its Best!!! My family and I (total 9 people) stayed a week a Eureka this summer. Eureka is located in Mountain Village about 3 minute walk from the grocery store which has connecting gondola to the main square in Mountain Village. The house is kept in very good shape from the spa, to propane for the gas grill to lotion and soap in every bathroom. I could not ask for better place to stay in Mountain Village. Also, the views from the patio were great!!! Eureka is located 120 yards from the ski slopes in winter and the market,liquor store and gondola are a short walk away. CANCELLATIONS AND REFUNDS Bookings cancelled 60 days or more prior to arrival are subject to a cancellation fee of 10% of the total booking cost. Bookings cancelled 30 to 60 days prior to arrival will incur a cancellation fee of 20% of the total booking cost. Bookings cancelled less than 30 days prior to arrival will incur a cancellation fee equal to all money paid for the booking.